Alright Hunger Games fans, here's your chance to go down in history as the coolest member of your friend circle by winning two tickets to the premiere of The Hunger Games: Catching Fire. In honor of the 75th Hunger Games/Quarter Quell, we're absolutely stoked to be one of 75 websites in possession of two tickets to one of the year's biggest and most anticipated movie premieres, to be held this November 18 in Los Angeles. And speaking of tickets, we're also happy to announce that advance tickets for The Hunger Games: Catching Fire will go on sale beginning October 1, so bust out that big red marker, circle Tuesday, October 1 and cancel all plans. You'll want to snag your tickets for this one as early as humanly possible. While we wait for that clock to tick-tock its way to October 1, you can throw your name in the hat for those two premiere tickets by leaving a comment below telling us your favorite thing about the Hunger Games series. We'll announce the winner on September 30. 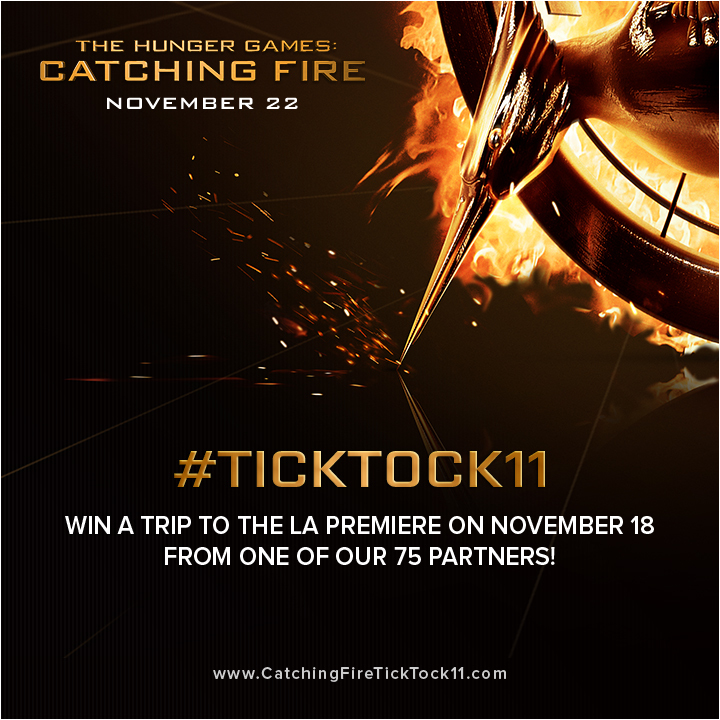 To see all 75 sites participating in the premiere ticket giveaway, head over to CatchingFireTickTock11.com. And for more info on all the #TickTock moments, hit up this site. The Hunger Games: Catching Fire hits theaters on November 22. For this contest's official rules, please click the link below.